Wendy Hood, CRNA has developed a sterile light cover for operating rooms that can help prevent surgical site infections. Surgical site infections cost the health care community billions of dollars each year in the United States and account for approximately 22 percent of all hospital-acquired infections. A Birmingham nurse anesthetist recognized an opportunity to prevent cross contamination in operating rooms by covering the overhead light. She has developed a clear plastic cover for surgical lights that will provide a sterile barrier and help protect patients. 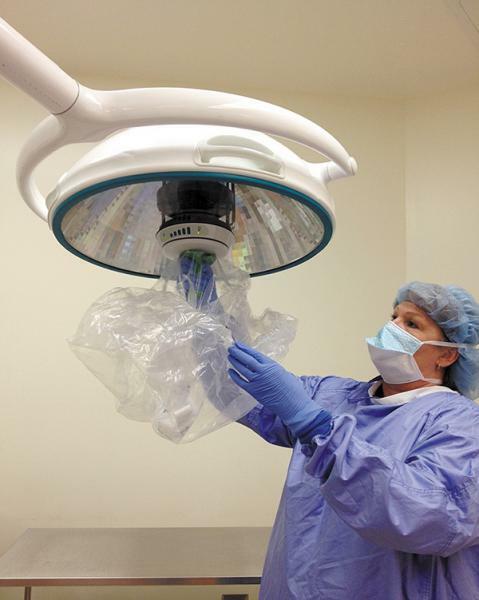 Wendy Hood, CRNA has over 30 years of operating room experience and believes the new Clear Plastic Surgical Light Cover can decrease the physical and financial costs associated with these infections. Her idea occurred during a routine total knee replacement procedure. "As the surgeon was hammering the prosthesis into place, a piece of tissue flew up and hit the non-sterile lens of the surgical light and fell back into the patient's wound," she says. "The problem became clear to me. The surgical lights need a sterile protective cover to prevent contamination and reduce a patient's risk of a surgical site infection." An article published in the April 2013 American Journal of Infection Control confirmed the risk of contamination from a study of cultures obtained from surgical lights. Results showed Staphylococcus, Streptococcus, and Neisseria bacteria on the lights. "And those cultures were obtained after a routine cleaning," Hood says. "Protecting the operating room light from blood, fluids and other debris will provide a sterile barrier and maintain the integrity of the sterile field to prevent cross contamination. The light cover also will reduce OR turnover time by reducing the time required to manually disinfect the lights between surgeries. Changing the cover between procedures protects each patient from the risk of cross contamination from another patient as well as inadvertent and unknown contamination from any member of the OR team who repositions the light." The sterile, disposable drape is a low-cost solution to help prevent infection. Currently, there are no competitive products in the U.S. marketplace for elimination of potential sources of SSI, which can be detrimental to patients and can result in increased costs, lost revenue and penalties to hospitals. "Statistics demonstrate the need for a practical, low-cost solution that will eliminate operating room lights as a source of contamination," Hood says. "Infection Control Today polled OR nurses regarding their belief of the most critical components of infection prevention. 67 percent said 'maintaining a sterile field,' and 43 percent said 'proper barrier protection.'" Procedures where patients are especially vulnerable to contamination from unsterile overhead lights include orthopedic, spine, cardiac and neurosurgery surgeries because of the use of saws, drills, and irrigation fluid. "Those procedures can create fluid spatters and aerosolization of bone and tissue," Hood says. "A break in the sterile field can cause an adverse outcome for the patient and can also result in lost revenue for the hospital because of added personnel time, anesthesia time and operating room time to reestablish the sterile field. The light cover will provide protection to patients and cost savings to a hospital's bottom line by maintaining the integrity of the sterile field." Hood began development of the Clear Plastic Surgical Light Cover about 10 years ago. After years of design and testing, the product is ready for use. She began marketing the light covers in July. "I felt it was my mission to develop this product. It has become a passion and obsession to provide this product for surgical patients to help protect them from possible surgical site infections," she says. Hood has a licensing agreement with American Surgical Specialties Company which will market to hospitals in Birmingham initially, with plans to expand the coverage later. "This is a new product and a novel innovation," Hood says. "I am excited to provide it. We must all protect patients to the best of our ability and be vigilant for any breach that could cause harm."